Most people these days have heard of the health benefits of consuming omega-3 fatty acids, found in flax seeds, walnuts and cold water fish, such as salmon. Recently, omega-7 fatty acids have taken centre stage as a beneficial addition to our health. Omega-7 is a monounsaturated fatty acid (MUFA) containing palmitoleic acid; this fat is also made by the body, therefore it is not classified as essential. There are food sources for omega-7, such as macadamia nuts and the sea buckthorn plant. Sea buckthorn in particular is receiving a lot of attention lately as a beneficial food with health benefits. Sea buckthorn is an ancient shrub with high levels of omega-7 used for centuries as a healing food in Tibet, India and China. There are many products today containing sea buckthorn seed and fruit oil, including face creams, serums and capsules for internal use. Here are some of the claims for this “newly” discovered phenomenon. Dr. Oz praises the “miracle berry” as an aid for weight loss. Preliminary animal studies have shown that the palmitoleic acid contained in sea buckthorn berries will signal the body to stop storing unnecessary fat. 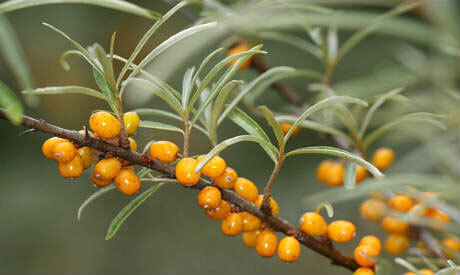 Sea buckthorn oils have been used in China and Russia to treat skin disorders for a long time. A study published in 2000 in the Journal of Nutritional Biochemistry on skin dermatitis showed promising results for the fatty acid composition of the skin after four months with topical use of sea buckthorn oil. Omega-7 is present in the epithelial cell membrane of sea buckthorn, and taking a supplement with this fatty acid may help the skin appear more supple and smooth. Beautiful skin starts on the inside, but the omega-7 fatty acid may help internally as well. Omega-7 may help maintain the integrity of the cell walls for people with inflammatory bowel diseases or other issues with the gastrointestinal tract. Another study published in 2000, explored the benefits of adding macadamia nuts (a good source of palmitoleic acid) to the diet. The results point towards the beneficial effects of palmitoleic acid on cholesterol levels compared to eating the typical American diet. Diabetic mice administered palmitoleic acid saw an improvement in their hyperglycemia due to improved insulin sensitivity. Although most of the studies are done on animals and they are in the preliminary stages, there are some positive results that may help people especially with the abovementioned issues. For instance, people with inflammatory bowel diseases, diabetes or skin disorders may want to investigate the benefits of omega-7 further.